It has never really worked well for me. #2 Related Bug: Choosing to Toogle List type doesn't work for sublists ... I have to highlight and run the option again for any sublist in a long list. and write more tomorrow (Sunday). when you ran the full cleanup command?? whether I select the whole document, part of outer list, part of inner list. 3. Toggling inner or outer list types works properly. using a recent version of Composer? 1. Is toggle list type suppose to toggle inner lists? when I select everything? 2. It looks like the "Cleanup List" messed up my formatting in my "cleanup before" ... so it probably doesn't make sense. I guess I didn't catch that. That's one of the bugs ... it did some kind of destructive operation and I lost that original text from the demo file. It was a correctly formatted bullet list, as far as I'm aware. I had copy/pasted an excerpt to play around with in my sample file. But I don't have the original in the same state any more to test it. I created a video explaining my problem, I'm not sure how to reproduce it. It seems to be when I'm copy/pasting sections and moving/indenting and writing my articles. That I run into situations where I want to switch from bullets to numbers (or vice versa). to do it. I could theoretically add a "toggle lists and sublists"
by the clean up code based on how it works. Thanks for the update on how the feature works! I'll try and capture issues the next time I write an article. ... 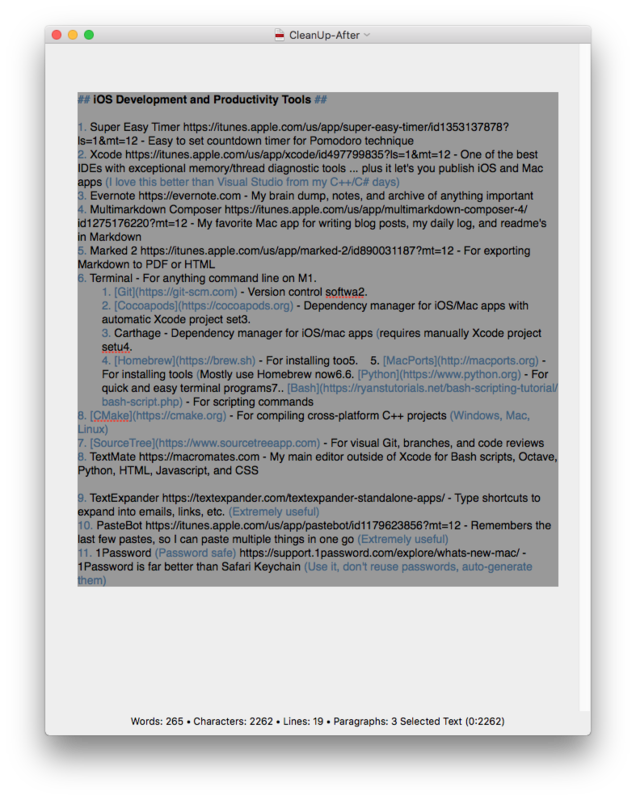 I just posted my blog post, thanks for the great Markdown tool! It's over 3500 words plus links. Multimarkdown Composer was great to use to write the initial draft! Congrats on completing the post! Fletcher closed this discussion on 20 Jun, 2018 03:57 PM. Ok, I'm in the middle of a new article and I've got my outline/notes, and I'm trying to clean up the lists (fix numbering). Actual: When I select and try to clean up this list, it destroys my content. I've created a before/after, and I'll include my current work in progress notes. Expected: I should see the outer list re-numbered 1-11, but it deletes some of the text, and incorrectly numbers, and puts numbers on ends of lines. It looks like the last 2 characters (3 characters with newline) are chopped, is this related to having a number in the lists? list items does not change the behavior, so that's not the problem. Thanks again for the sample file!! I found the error, and it looks like this is fixed for the next release. Thanks again for the example!! Fletcher closed this discussion on 30 Jul, 2018 09:40 PM. Fletcher closed this discussion on 03 Sep, 2018 07:52 PM.